Content is sufficient for use according to our recommendation for 62 day(s). 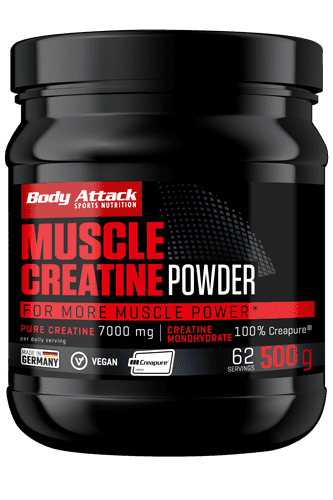 Which products can Muscle Creatine be combined with best? With Body Attack Carbo Loader to supply the body and the musculature with sufficient energy before and after training. With the amino acids Arginine 6000 and Beta Alanine, as Arginine plays an important role in the protein metabolism and Beta Alanine has a part to play in the muscle-creatine metabolism. With high-quality Body Attack Extreme Iso Whey, used to build and preserve muscle mass, especially after intense training sessions.